It is time to clean up those messy cables around your TV and office. Let's remove the eyesore of tangled cords. The Cable Concealer by SimpleCord contains everything you need to create that clean and stylish design in the home or at the office. 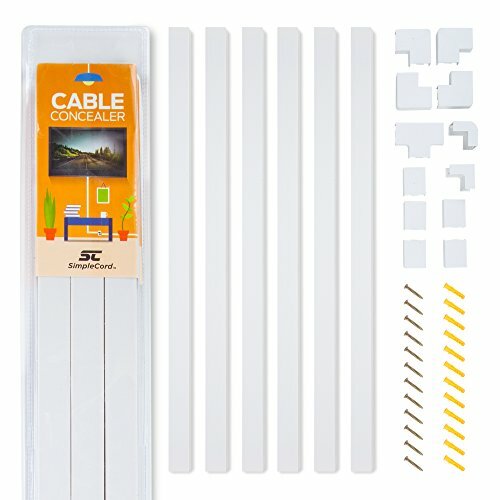 Providing you with 150" in total cable cover raceways and 12 different connector pieces it is the perfect cord management kit for any job. - 6 1 1/8"x25" cable cover raceways. - 6 Optional extra strength peel and stick tape for easy installation. - 12 screws with drywall anchors. We are proud to offer 100% Customer Satisfaction 30 day money back guarantee. If you aren't happy, we aren't happy. Act now and click 'add to cart'! SimpleCord is a registered trademark of Fifth Street Goods LLC. COMPLETE CABLE MANAGEMENT KIT: The Cable Concealer by SimpleCord is the perfect cord organizer. It contains everything you need to organize and clean up those messy cables. 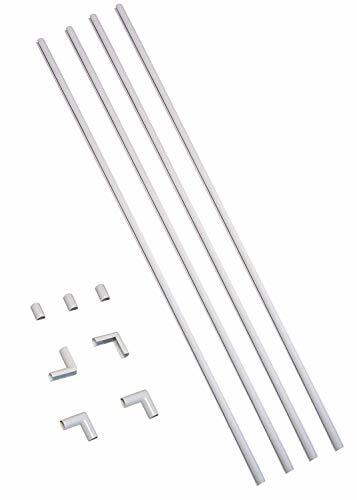 Each package contains (6) cable cover raceways 1 1/8" x 11/16" x 25" each. That is 150" of cable concealment! EXTRA STRENGTH SELF ADHESIVE TAPE: We have upgraded to a premium and stronger self adhesive tape. With our easy to follow instructions you can choose whether you want to use the peel and stick tape or the drywall anchors with screws. There is no need to cut giant holes in your walls to hide wires or cables. IMPROVED FUNCTIONALITY: Our cord cover kit blends with any decor. We made simple changes so that the covers SLIDE EASILY off the raceways. It has a slim and sleek design. And you can paint the wire covers to match the color of your wall. If you need a different size just simply cut the covers to your desired length. PREVENT DANGLING CORDS: Protect your children from cables and cords hanging near the floor. This is a quick and easily solution to your problem. Simple Installation will allow you to safely conceal the cables around your TV, desk, or baseboard. No more messy, tangled or unsightly cables! Our cable channels make any room in your home or office look great! Our cable management kit comes complete with 8 easy-to-connect cable channels so you can easily conceal those unattractive power cords, extension cords, cables and more. Also, our raceway kit comes with everything you need for easy, trouble-free installation. Not only will our cable concealers make your space look more organized, but they will also keep your family safe from potential accidents! Home entertainment systems Speaker cables Phone/Fax lines Lamp cords Computer cords Ethernet cables Home office wiring And more The convenient self-adhesive backing facilitates a simple and easy installation on baseboard or wall. 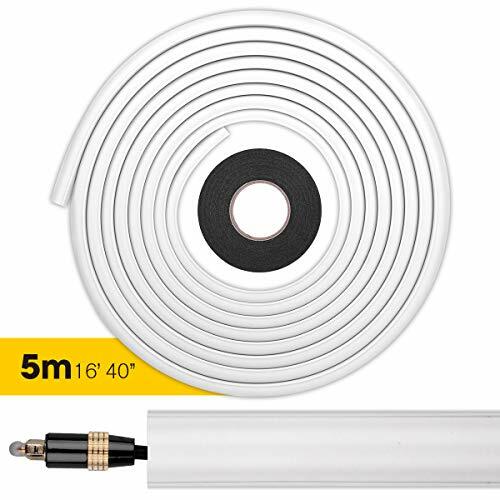 - 1 roll of clear PE mounting tape Organize your cords today by clicking "Add to Cart" now! Our mounting tape is strong. Once installed, it will remain securely in place. In order to remove it, merely direct some heat on the tape with a blow dryer or heat gun to soften the adhesive. This will allow you to easily remove the adhesive strip and cable without damaging your surface areas. D-Line round decorative raceway, hides cords and subtly blends with d cor. D-Line s cable hider is the ideal cable management system to cover low-voltage cords. 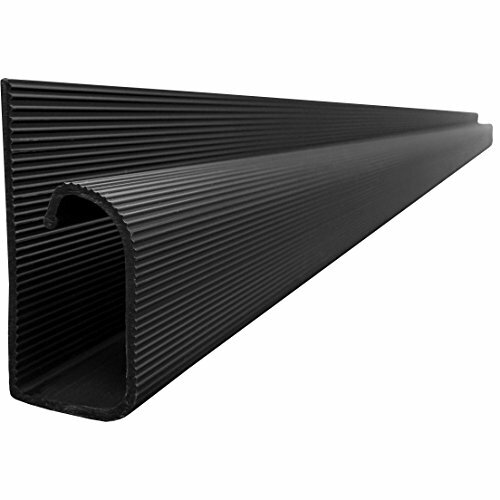 D-Line cable management raceway is easy to install, and looks great on any surface! D-Line cable covers neatly manages cords. Popular to cover ethernet cables, hide speaker cables to conceal alarm cables and to hide telephone cords for example. 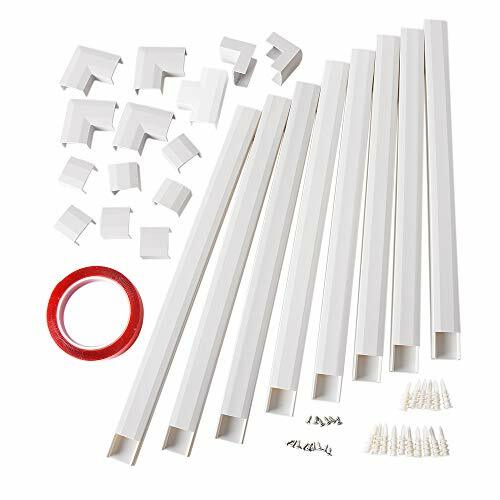 The neat size and round shape enables the mini cable cover raceway to appear as a natural top section of the baseboard. 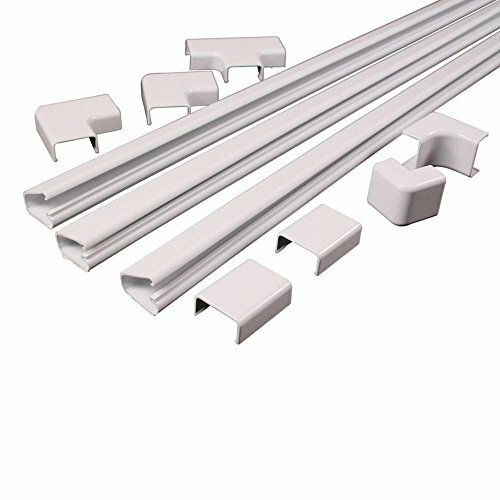 D-Line Raceway - Paintable White - With a unique half round profile, D-Line cable wall covers subtly blend with baseboards meaning you can neatly hide cords, wires and cables in your home. Quick and easy installation - produced from high grade pvc, cable hider can be easily cut to required length. Then simply peel and stick D-Line cable raceway to a smooth and clean wall or surface. Paintable for the perfect finish. Delamu Cable concealers always provide a clean and tidy room for your happy family and working time! Conceal and organizer unsightly cords in the family room, office or bedroom with the cable concealer kit. 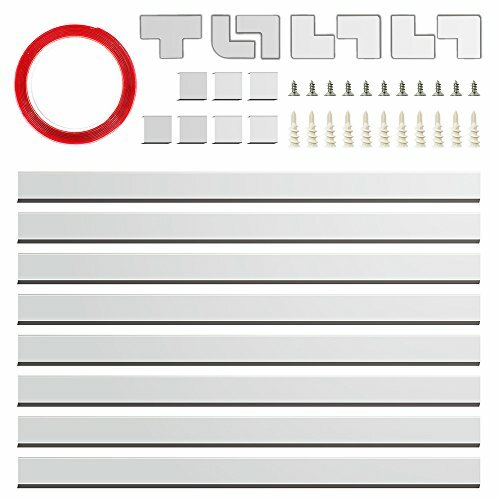 Easy to install with either screws or PE mounting tape. What does it used for? Dress Up Your Home and Office: Delamu Cable cover conceal and organizer unsightly cords in home and office. It is a easiest way to organize your messy cords and provide more place for activities. 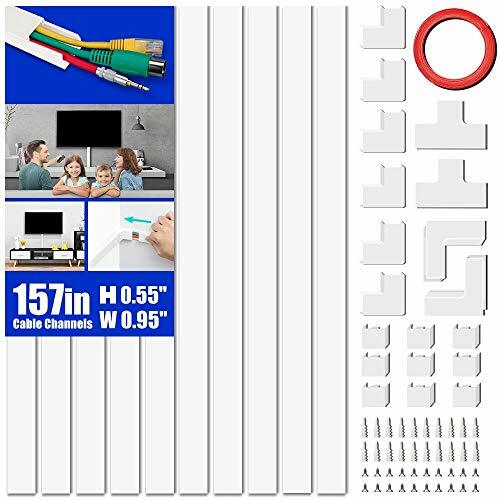 10 Cable Management Channels: Including 10 channels, each channel L15.7in x W0.95in X H0.55in, 19pcs different connectors, 20pcs screws and 20pcs anchors, 1 self-adhesive. Total Length 157 inches. Simple and Easy Installation: Each package contains screws and anchors, or you can opt to use self-adhesive tape. Both method is simple, you can choose the one you want. Prevent Your Child and Pets from Danger: Hiding the cables or cords near the floor, protect your children and pets keep away to play the cables. Installs in 15 Minutes Messy cords? Check. Phillips screwdriver? Check. A positive attitude? Trick question! That doesn't matter. Installing this cable management solution will be over so fast, you won't have time to get crabby. We've provided all the hardware. You're only responsible for the handiwork. The easy-peazy, 6-screw kind of handiwork that will take you less than 15 minutes. (Just in case we didn't made that clear.) Keep it Clean, Guys This is how we get ants! Oops, sorry - that's a different kind of mess. But dangling, ugly wires is just as punishable of an offense. This on-wall cable management solution will tame your tangled cords, taking your setup from child's play to #adultingallday. All Setups Matter Up high? Down low? Wherever your TV cables plug in, this cable tunnel will go. (So, we're in a rhyming mood. Sorry.) Included cord cover pieces are 48", but can be cut to size to fit your unique setup. Like your setup clean and sleek? It's paintable for wall matching, which is pretty sweet. (Sorry. Again.) We're Here to Help Questions? Installation concerns? Testing knock-knock jokes? We're here for it. Literally. We've got real-life, know-it-all product experts standing by, ready to help seven days a week. No one should have to go through this. The wall, that is. This 100% American-made, on-wall TV cord cover is a great-looking, easy alternative to in-wall cable management. Know how to use a Phillips screwdriver? Sweet. Then you can also install this cord organizer. And in less than 15 minutes. Boom! Snap out of it! Cord cover easily snaps on or off to add or adjust contents at any time. Plus they are paintable to blend in. You can hack(saw) it! Accommodating ideal TV wall mount height (42-48), included cord cover pieces are 48, but can be cut to size for your setup. Our ECHOGEAR Pros are here to help 7 days a week. Go to our website or check your product manual for all the different ways to get in touch with our real-life product know-it-alls. Cord Mate Cord Organizer is streamlined to blend with any decor. Great for concealing and organizing phone wires, cords and speaker cable. Perfect for family rooms or bedrooms. Self-adhesive backing makes it simple to install on a baseboard or wall. Paintable. PERFECT SINGLE CORD CONCEALER: Hide one cord, including ethernet, speaker wire, or an extension cord. Want To Know How To Hide Cables In Your Home And Office Space? Our cable hiding kit comes complete with 8 cable channels to make it easy to conceal ugly power and extension cords. Get everything you need to organize your electronics, making your space more attractive and safer, too! Designed in a go-with-everything white, our cable channels make any room in your home or office look great. No more messy and dangerous cables! Our cable channels are ideal for organization and electrical cord management. Depending on your surfaces, choose to use the mounting tape to stick and secure or use the mounting screws and anchors. Get your cords organized today by clicking "Add to Cart" now! Note: Our mounting tape is strong, after installation, it will stay well in one place. When removing, warm it up with a blow dryer(better a heat gun if you have) to soften the adhesive, then it will be easily pulled off without damaging the surface. TThe 1/2 round profile of D-Line cable raceway subtly blends with d cor, the profile of D-Line cable hider is ideal to hide cords from wall mounted TVs. D-Line cord covers are ideal for covering cables around desks in offices, for hiding home entertainment wires, speaker cables & TV/video cabling. 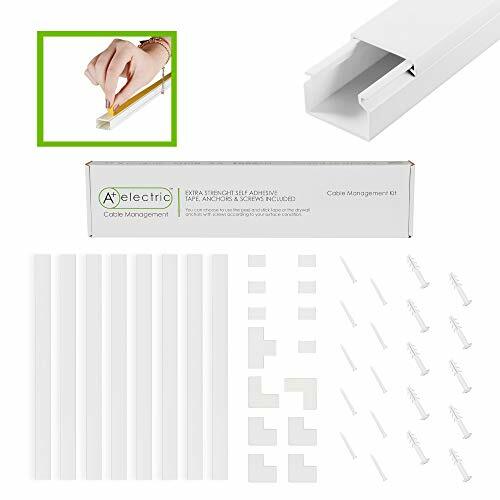 Quick and easy to install, simply peel & stick self-adhesive backing of D-Line cable hider to surface (can be screw fixed for added stability). 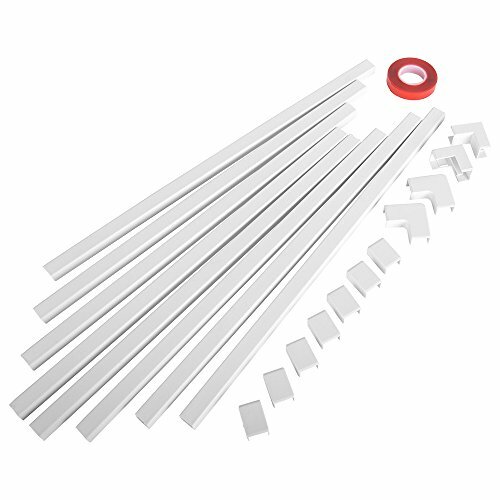 The innovative single piece design of D-Line cable raceway also makes it easy to add or remove cables at a later date. D-Line Cord Covers are also paintable for the perfect finish. When concealing cables on-wall, the single-piece hinged latching design of D-Line wire covers give flexibility to simply add or remove cables at a later date. 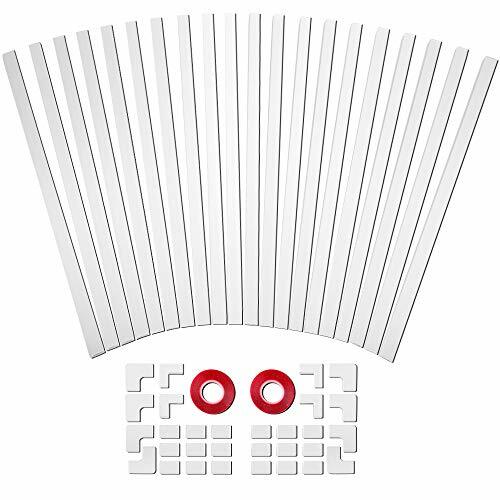 Dimensions of D-Line TV Raceway: 2 (W) x 1 (H) x 39 (L). 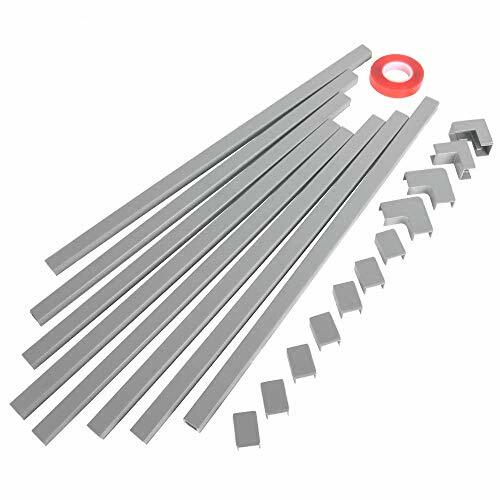 Made from a high-quality pvc so cable covers are easy to cut to required length. Especially suited for covering home entertainment wires, speaker cables, TV/video cabling and home office wiring. Organize and hide cords and cables easily. Self-adhesive backing makes for easy installation. Stylish design complements any interior setting. Paintable. PROTECT YOUR KIDS FROM CABLE CATASTROPHE: TV cables can cause tripping and other safety hazards if left dangling. Now you can safely hide your TV wires, keeping out of reach from curious little hands. EVERYTHING YOU NEED TO HIDE WIRES WITH EASE: Offers 10' of cable concealment; kit includes 12 connector parts for flexible install: 4 CordMate II Cord Channels, 3 C59-Couplings, 2 C56-Flat Elbows, 1 C57-Inside Elbow, 1 C58-Outside Elbow, 1 C51 T-Fitting. Hiding cords from TV, computer, and other electronics just got easier! 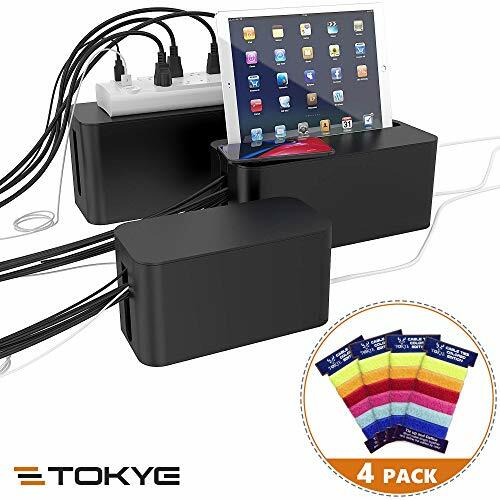 Our cable management kit (High quality PVC plastic material) comes complete with 8 easy-to-connect cable channels so that you can easily conceal your unattractive power cords, extension cords, cables and more. Our system comes with everything you need for easy, pain-free installation. And, not only will our cable concealers make your space look more organized, but they will keep your family safe from potential accidents, too! Depending on your surface, select either the mounting tape to stick and secure or use the heavy duty mounting screws and anchors. Note: Our mounting tape is strong. Once it's installed, it will stay in place. In order to remove it, warm up the tape with a blow dryer or heat gun to soften the adhesive. This will allow it to be pulled off easily without any damage to your surface. 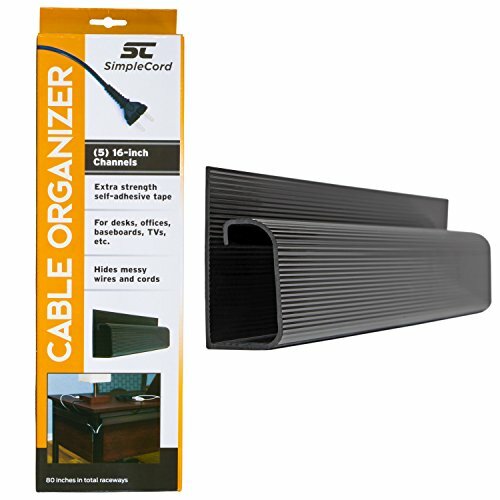 The J channel cable organizer by SimpleCord is exactly what you need to clean up those messy cords around your desk and office. 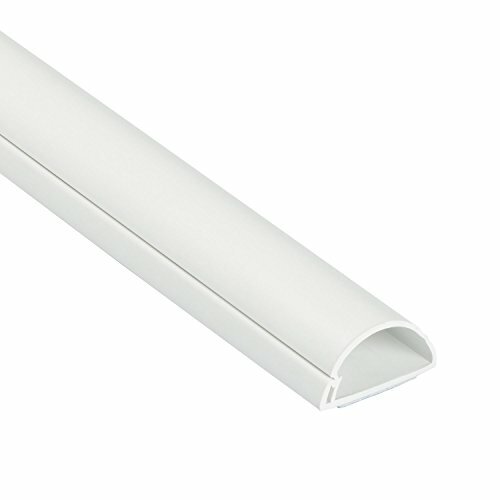 The unique design allows for flexibility with shorter channels and yet still offering 80" in total raceways. Do not fear your raceways falling off your desk after only a couple of days. Our extra strength self-adhesive tape is stronger and twice as wide as similar products on the market today. 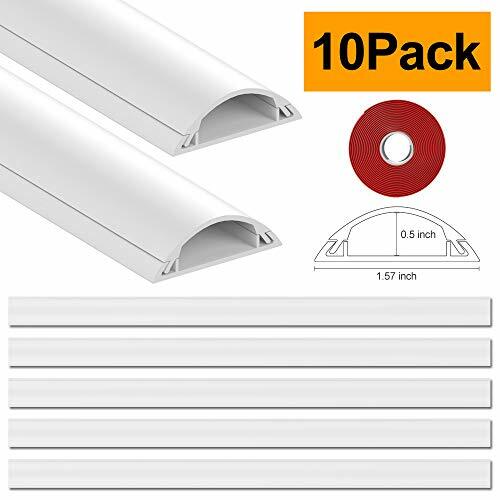 Product Contents Include: (5) 16" J channel raceways (5) Extra strength self adhesive tape We are proud to offer 100% Customer Satisfaction 30-day money back guarantee. If you aren't happy, we aren't happy. Act now and click 'add to cart'! SimpleCord is a registered trademark of Fifth Street Goods LLC. Extra-strength tape included in each kit. Do not worry about your raceways falling off your desk or wall after just a week. We have included an extra strength self-adhesive tape that is twice as wide and much stronger than similar products on the market today! Each package contains five 16-inch channels. If your project needs flexibility this is the perfect kit for you. Whether you will be running your cords horizontally or vertically the shorter channels help make installation easy. Non-locking channel for easy access. The open top design allows for easy installation and management of your cords. This is especially useful for power cables that you might move around quite a bit like a phone charger. The raceways can be cut if you need a different size. Perfect for an office or living space. 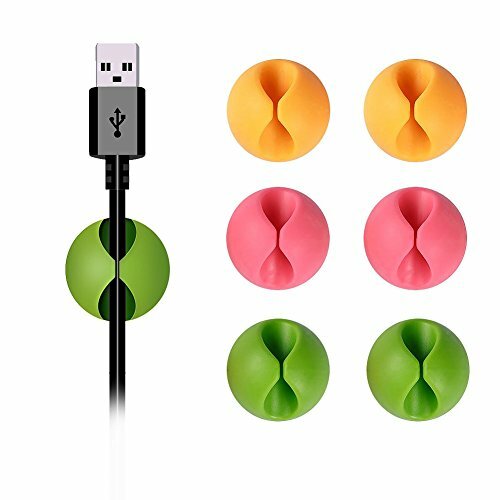 The J Style Cable Organizer by SimpleCord is ideal for desks, offices, baseboards, or Kitchens. It is a simple solution to your tangled, messy cords. Remove the eyesore of dangling cords. Protect your children from cables and cords hanging near the floor. If you worry about cords laying on the floor this is a quick and easily solution to your problem. Simple Installation will allow you to safely conceal the cables around your desk or baseboard. *Shintop's cable drop cord clips make your life tidy . *This wire clips holder is Suitable for office and home use. *6 pcs cable drop clips are easily removeable or extended. Wiremold Cord Mate II Kit provides everything to hide the messy tangling cords and to create stylish design in the home or at the work. The Wiremold white cord cover kit has a slim and sleek design and blends with any d cor. Its channels can be painted to match the color of your wall. Wiremold Cord Cover, suitable for covering home entertainment wires, speaker cables, TV/video cabling and home or office wiring. Organize and hide cords and cables easily, whether it has Multiple cables or single cable wire the channel is big enough to fit in. Step1: Cut strip to the desired length. Step3: Insert cord and snap shut. Step4: Press firmly against the wall. Use elbows and couplings as necessary. l2 feet of cord channel (3 four-foot sections), two flat elbows, inside elbow, outside elbow, two couplings, and T-fitting. COMPLETE CABLE MANAGEMENT KIT: The C210 Cordmate II Cord Organizer Kit is the perfect cord organizer. It contains everything to conceal and organize those messy cables. Each package contains 3 CordMate Cord Channels of 48 inches each. That's around 144 inches of cable concealment. SIMPLE AND EASY INSTALLATION: Wiremold Cable Cover Kit offers flexibility while installing the product. Just peel and then press to install the wire covers. The self-adhesive backing makes it easy to install on a baseboard or a wall. If you need a different size, simply cut the covers to your desired length. BEST SELLER CORD COVER: Wiremold CMK210 Cord Mate Kit is the Amazon's Best Choice and it also comes with a manufacturer's warranty. 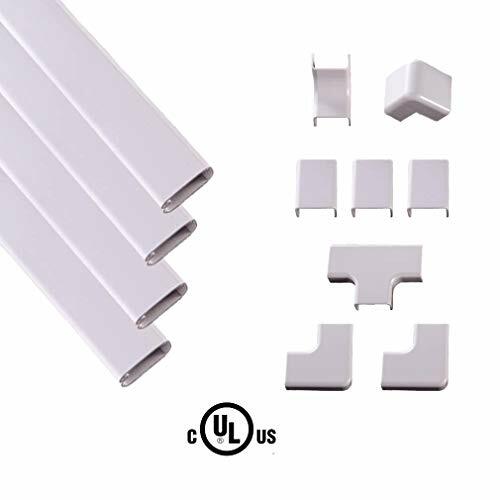 SLEEK AND STYLISH RACEWAYS: This Wiremold white cord cover kit has a slim and sleek design and blends with any d cor. Its channels can be painted to match the color of your wall. This cord cover is ideal for phone wires, cables, power cords and speaker wire. 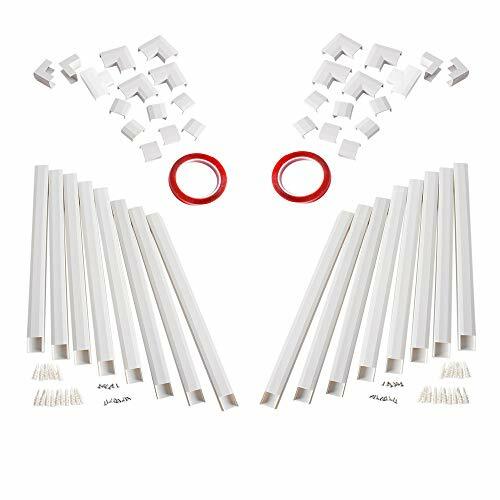 BIG MONEY SAVING CABLE RACEWAY PACK: The kit includes 9 connector parts: 3 X 4-foot long of Raceways Cord Cover Channel, 2 X Flat Elbows, 1 X Inside Elbow, 1X Outside Elbow, 2 X Couplings and 1 X T-Fitting. You know that terrifying mass of knotted cables under your desk or behind your television? Yeah... let's do something about that. The WireTamer is our answer to the cable management problem. 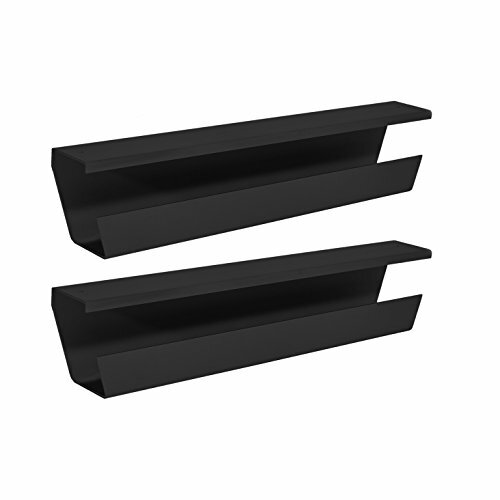 Constructed of 2mm thick extruded plastic, these cable trays are super-sturdy and extra-durable. They look good, too: clean, straight lines, smooth walls, and sag-proof design make for a low-profile addition to your desk. And they're made of 100% recycled plastic. The WireTamer easily mounts to the underside of your desktop, TV stand, or media center, providing a neat cable raceway that handily contains a power strip, a whole mess of power-and-monitor cables, or your secret chocolate stash. The perfect solution for your cable management mess! Works great for holding AC power supplies secure and out of the way. The 2U server rack cable management with cover mounts to a standard 19" 2 or 4-post rack to help you organize horizontal cabling, through a covered cable duct. This TAA compliant cable raceway adheres to the requirements of the US Federal Trade Agreements Act (TAA), allowing government GSA Schedule purchases on this network rack cable management organizer. 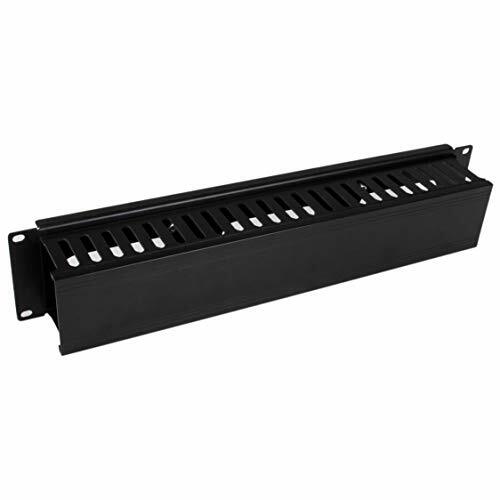 The slotted wire duct organizer features a removable top cover that makes it easy to add or remove bundled cables quickly. The data center cable management organizer also offers a series of fingers on either side, as well as pass-through holes at the back to help you route your cables where you need them and reduce cable strain in the process. Made of high-quality steel and plastic, the finger duct cable manager is a durable solution for your server room or wiring closet. For easy installation, this horizontal cable organizer comes complete with 2 sets of rack screws (M5 and M6). This patch panel cable management is backed by a StarTech.com 2-year warranty. 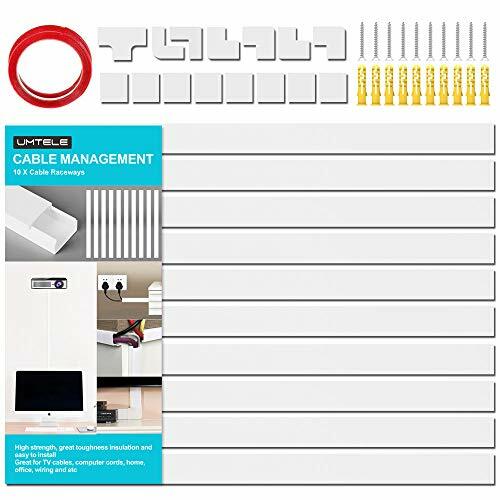 Cable Management Kit- Cord Cover TL:125" for 1-2-3 Cables, Organizer Raceway Electric Wire Concealer On-Wall White Paintable 8 Pieces Self Adhesive Channel Size (WxHxL) 25x16x400 mm/0.98"x0.63"x15.75"
Cable Cord Cover - Concealment Kit Contents: 5 Adhesive-Backed Channels 10 Drywall Anchors and Screws 4 Straight Connectors 1 L Connector 1 T Connector 1 Inside Corner 1 Outside Corner Ideal For Any Rooms Conceal cords and cables in any room of the home for a clean, organized appearance. Kitchen appliance cords can be concealed along the side splash or countertop edge. lamp cords can be concealed down the wall and along the baseboard. Improve the look of a home office by hiding the printer, computer and ethernet cables out of sight. Capacity: For Max. 3 Cables (Power x Patch x HDMI x Coax x Extension Cord) Material: High-Quality PVC Outer Dimensions: 25x16x400 mm = 0.98x0.63x15.7 inches Inner Dimensions: 23.5x14.8x400 mm = 0.93x0.58x15.7 inches Total Length: 125" Uv Durations: Yes Paintable Shield: Yes Fireproof: Yes Easy Installation Guide: Yes WE GUARANTEE YOUR SATISFACTION 100% and are here to help in any way possible. Please don't hesitate to contact us for any reason. Click Add to Cart to start organizing and beautifying your homes today! STRONG SELF-ADHESIVE TAPE: A Plus Electric Cord Cover channel kit comes with very strong adhesive mounting tape on backside. Due to the strength of the adhesive used we strongly suggest taking extra precautions to assure the placement of the channels are precise. Attempts at realigning or replacing the cables may result in damage to the tape or surfaces they are being applied on. Please read the Easy Installation Guide before use. PROTECT YOUR LOVED ONES: A Plus Electric Wire Hiding Kit protects to your children and babies and pets from hazardous, cluttered, loose cables. The right cable management system can help saving your children from choking hazards. A Plus Electric Cord Cover strives to create a safe environment for your loved ones. 100% COSTUMER SATISFACTION: A Plus Electric Cable hiding kit is certifited internationally by RoHS, CE . Channels made by high quality, flexible PVC (C2H3Cl) material. We guarantee quality wire channels. Please contact for any further inquiries. UMTELE cable hiding system help you to hide cords, wires from TV, office and other electronic cables, make unnecessary and clutter cords become clean and neat, save your time and space. An effective method to solve thorny cable problems. Make your life better! One-Cord Cable Covers for a Sigle Cable: The best choice when you need a mini cable cover to concealer one cord. Designed to enclose a low-voltage wire or cable such as phone/fax cable, speaker cable, or lamp cord etc. Extra Length & enough connectors meet all your needs: Each Package contains 20 channels, L15.7in X W0.59in X H0.40in, total length 157in, 9 X Couplings, 4 X flat elbows, 1 X inside elbows, 1 X outside elbows, 1 X mounting tape. Extra Length & enough connectors meet all your needs: Each Package contains 10 channels, L15.7in X W0.59in X H0.40in, total length 157in, 9 X Couplings, 4 X flat elbows, 1 X inside elbows, 1 X outside elbows, 1 X mounting tape. Easy install with Extra Strength Self Adhesive Tape: We have upgraded to a premium and stronger self adhesive tape. You can follow instructions and simply secure the channel with the cable where needed. This product comes with 3 cable management systems. It stores your multiplugs and feeds the cables, from the plugs on it, to your devices, in an orderly manner. It has numerous benefits: The cover and higher ledged cable exit prevent dust and most moisture getting near the plugs. Its sleek monotone design makes it much less attractive to children and pets, keeping them safe, and giving you peace of mind. This product is sturdy and durable that's why we confidently give it a lifetime warranty. It is easy to clean - simply wipe with a dry cloth. The cable boxes are so easy to use. Simply fill them and click the lid. With three matching wire management boxes in this pack you get cohesion of design across your environment. You will hardly notice them compared to the untidy bundle of cables and plugs. The wire covers fit nicely against walls, on shelves unlike the unrestrained wires and plugs of multiple sizes. The power cord boxes are available in black or white to compliment your d cor. 2019 NEW PRODUCT DEVELOPMENT: Whether at home or in the office keep your plugs handy to your chosen location (on, under or behind the desk, TV stand, games console, even on the floor) without creating clutter and loss of space. ANY CABLE ORGANISED: An organized environment is an organized mind and a greater productivity. The cable holes are large enough for several cables so every device will have easy access to its charger or power source. SAFELY HIDDEN PLUGS: Keep the plugs and multi socket safely out of sight from pets and children and free from moisture and dust. Easy access to the plugs when required. 4 STEP USE: 1. Slip your multiplug with the relevant plugs in place into the care organizer box. 2. Feed the cables to the side. 3. Add the lid. 4. Place it and you're done.